Circa 1950's. Plastic, made in the USA by Emenee. under licence from Disney. 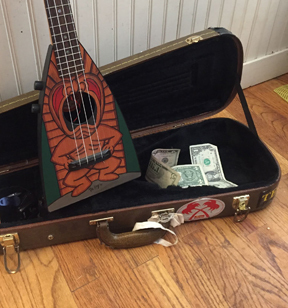 Emenee made a Zorro Guitar and Ukulele, which featured "Zorro" on horseback with his sword drawn, and the Zorro name on the top, just below the fretboard. and "Walt Disney" Productions" just below the bridge. The peg head also had the "Zorro" name and a standing Zorro. Zorro was a Spanish folk Hero created in 1919 by author Johnston McCulley. He dressed all in black with a cape and eyemask, and was an excellent swordsman and Horseback rider. His "Mark" was a "Z" which he would make with his sword. Since 1925 there have been at least 14 Zorro movies, several television shows, and Many books.